Ted Barrett & Phil Cuzzi are 2018's Honorable Umpires of the Year [2017 Winner: John Tumpane]. Voting Results (Top 5): Barrett (13.7%), Cuzzi (10%), Kerwin Danley/Doug Eddings (5.8%), Tumpane (3%). Award Winners: Ted Barrett (65) & Phil Cuzzi (10). 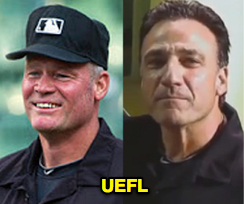 Ted Barrett & Phil Cuzzi are the Umpire Ejection Fantasy League's 2018 Honorable Umpires of the Year. Barrett received praise after working 18 innings of baseball for over seven hours during Game 3 of World Series, as well as the crew's UMPS CARE Charities visit to Boston Children's Hospital on the morning of Game 2. Related Post: Twofer - Plate Umpire Ted Barrett's 18-Inning Night (10/30/18). Related Post: World Series Crew Embarks on Boston UMPS Care Visit (10/25/18). Cuzzi, who finished the year with three ejections, including the Ben Zobrist "that's why we want an electronic strike zone" ejection in August, continued his ALS work this season. Cuzzi's charity, the Robert Luongo ALS fund, was established in 2003 in honor of Luongo, who died in 2004 from the disease, and its annual winter dinner draws baseball celebrities from Bob Costas to Tony LaRussa, Goose Gossage, Willie Randolph, and more. Related Post: Phil Cuzzi Fulfills Promise to Late Friend Luongo (2/20/17). Umpire of the Year: 2014. Honorable Umpire of the Year: 2012, 2013, 2014. Crew Chief of the Year: 2014, 2016, 2017, 2018. Ted Barrett now has 16 points in the Umpire Ejection Fantasy League (14 Previous + 2 Award = 16). Phil Cuzzi now has 19 points in the Umpire Ejection Fantasy League (17 Prev + 2 Award = 19). The next postseason award, Promising Umpire of the Year, will be released tonight.